New Member Classes begin this Sunday, October 2, at 9:45 AM at St. John's Lutheran Church, located at Highway 81 & Benjamin Avenue in Norfolk. Snag a drink and a donut in the Fellowship Hall, then head to the Nazareth Room on the main level of the Jobman Christian Education Center to meet with Pastor Justin to go over St. John's 101, which covers some of the basics of our church. Two more new member classes follow October 9 & 16 at 9:45 AM. On October 9th, we'll look information about the ELCA Churchwide Organization & Nebraska Synod. On October 16, we'll take a tour of our building & discuss the ministries that happen in the different spaces. Come join us for these classes if you want to know more about St. John's! 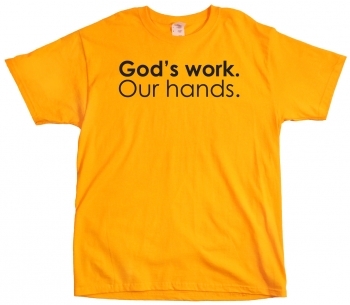 St. John's will be ordering additional yellow T-Shirts with the "God's Work, Our Hands" logo and St. John's personalization on the back. If you're still wanting a shirt and would like to place an order, please contact the church office @ 402-371-1985 or email Gail at gailer@cableone.net. Deadline to order is Friday, October 7, 2016. Our thoughts, prayers, sympathy, and condolences are with the family of Rev. Rollin Olesen, previous visitation & interim pastor at St. John's Lutheran Church, who died Monday, September 26, 2016, in Sioux City. Funeral Services are pending at the Wintz Funeral Home in Coleridge, NE, with funeral likely on Friday in Sioux City with burial in Coleridge. We give thanks to God for the gift of life we knew in Rev. Olesen. After a staff conversation with Pastor David, Pastor Justin and Jolene today, we would like to communicate to you the following information. 1. The Christian Ed. Team meeting has been canceled for tomorrow evening, September 28, 2016. As of this time, there does not appear to be any pressing items to be put on the agenda for this month to discuss. Sunday School is working well, and there are no outstanding issues for staffing, curriculum or changes in the printed out schedule through our newsletter that require a meeting for September. We will have a meeting next month on Wednesday, October 26, 2016, at 7:00 p.m. At the October meeting the Sunday School Christmas Program will be discussed, as well as other timely topics. In the meantime, if you have any items you wish to add to the agenda, please let Jolene know. We are hoping to have meetings with printed agendas and proposals communicated in a timely manner. Of course, items may be added to a printed agenda. We extend a thank you to those of you who participate in the Sunday Educational Program of the congregation. Attendance right now is both up and holding. This is something we celebrate. 2. For those who are parents of youth in the 7-12 grades: there had been discussion of having a meeting of parents with Aline Skogstoe and Pastor David to be scheduled on Wednesday, September 28. At this point, since there has been confusion and poor communication to those who are invited, Pastor David and Aline would like to suggest rescheduling this meeting to Monday, October 3, from 6:30-7:30 PM. This is a meeting for the parents of youth, to bring them up to speed on the basic programming for youth events from now through the end of 2016, as well as to discuss and share the vision of our youth programming for this same period. Both Pastor David and Aline invite parents to attend. This notice will go up through our text service, as well as on our social sites and the church calendar. 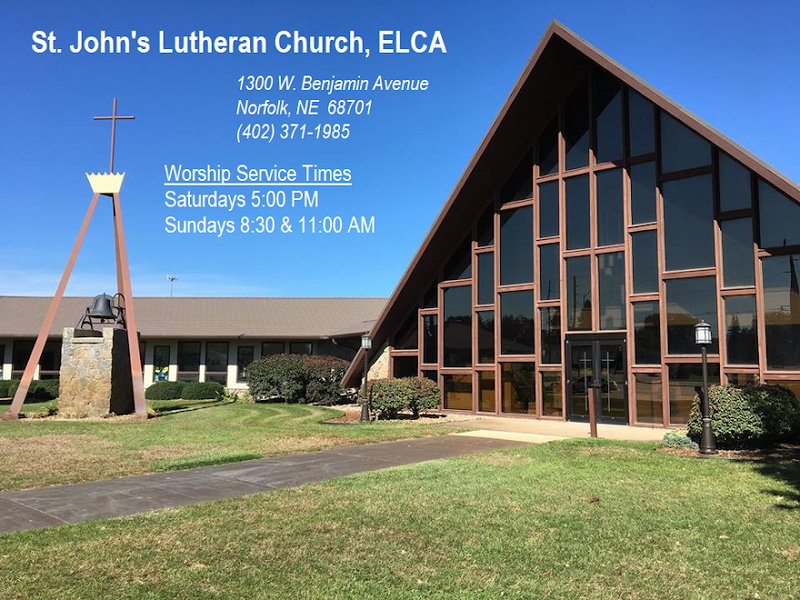 Thank you again for your participation, your prayers, and your interest in these programs of St John's Lutheran. Folks & Forks This Weekend!